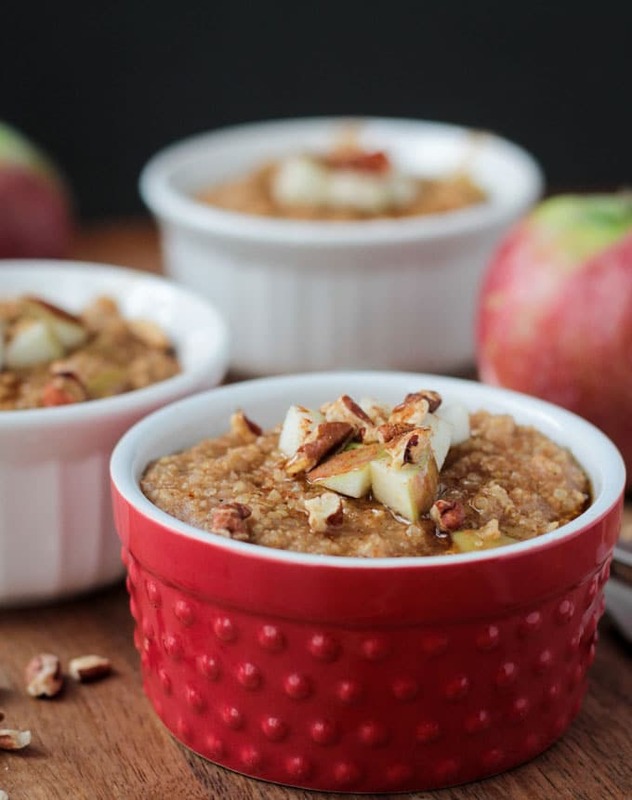 This Apple Pie Spiced Mixed Grain Hot Breakfast Cereal is a hearty, healthy, gluten free breakfast to get your day off to the right start! We eat a lot of oatmeal around here. My kids love it! In fact, one of my twins would eat it for breakfast, lunch and dinner if I let her. 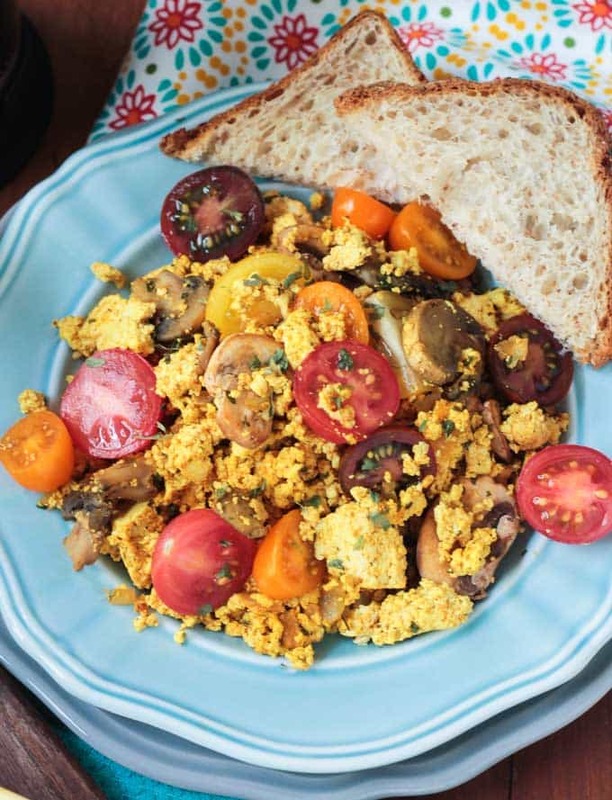 It’s a healthy, hearty breakfast that you can easily customize to fit your tastes. This week I decided to change it up just a bit and throw a few different grains together. I’ve tricked the kids before with millet in place of oatmeal, but this would be the first time I attempted to pull off several different whole grains in one bowl. Good news! 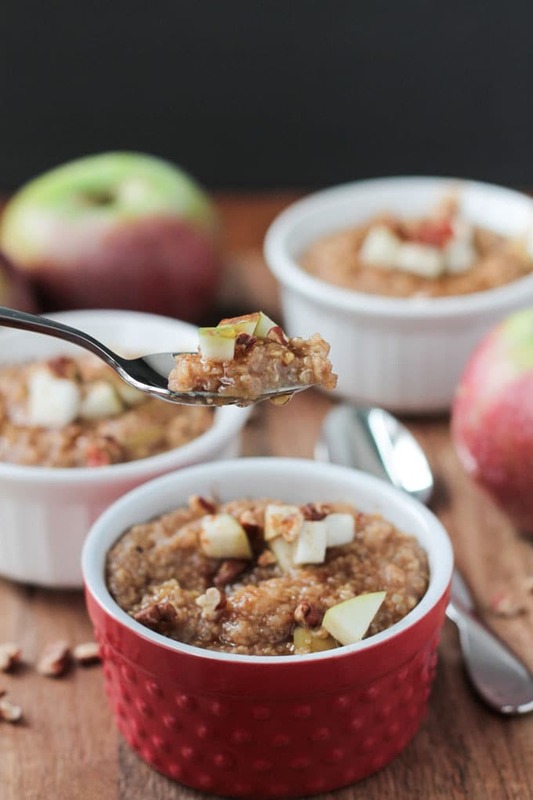 They loved this Apple Pie Spiced Mixed Grain Hot Breakfast Cereal and even dug into seconds! There is so much nutrition packed into one bowlful, you will feel energized and ready to take on the day! 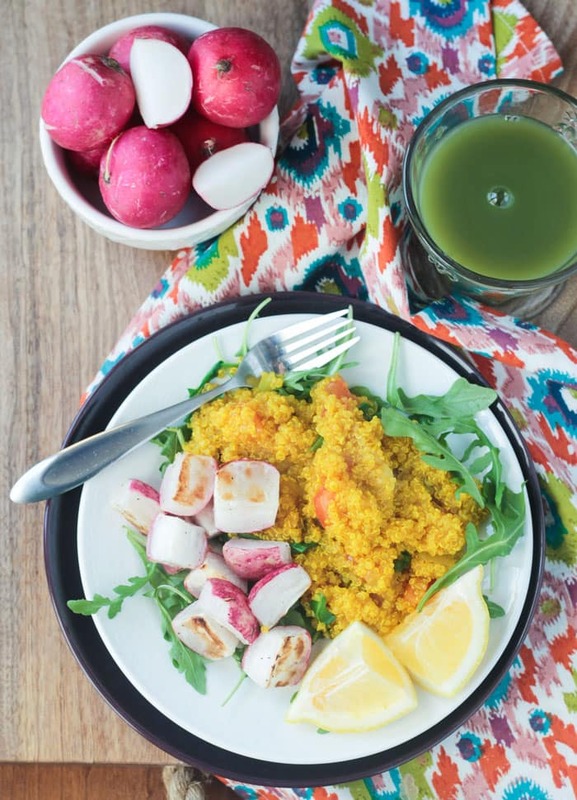 There’s quinoa, millet AND amaranth in this heart healthy breakfast! Those three ingredients team up to bring you an incredible amount of plant protein and fiber along with numerous vitamins and minerals, not to mention it’s gluten free! 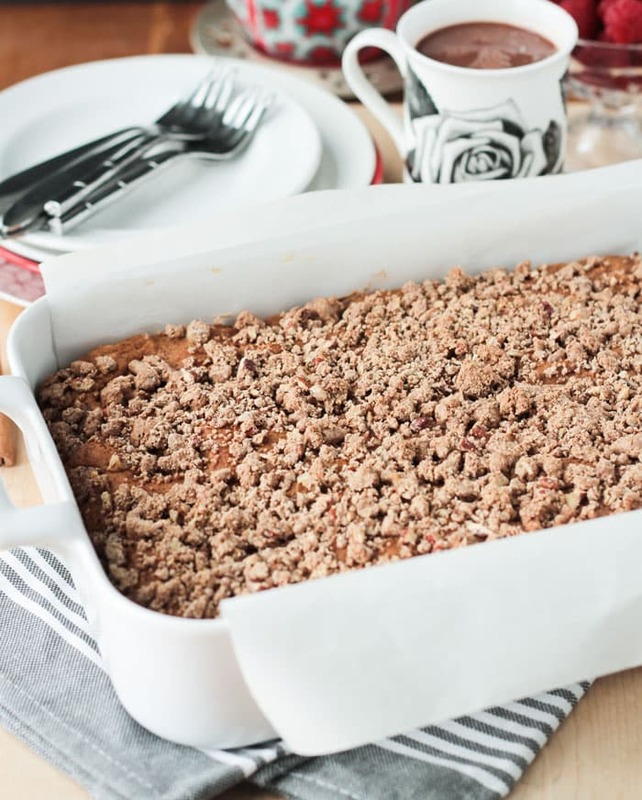 Whole grains, fresh apples, warming spices like cinnamon, nutmeg and ginger and a little sweetness – doesn’t that just scream cozy? Heck, forget about breakfast, I wouldn’t mind curling up with a blanket on my couch at the end of the day and a bowlful of this goodness (and probably some bad TV like The Bachelor too!). 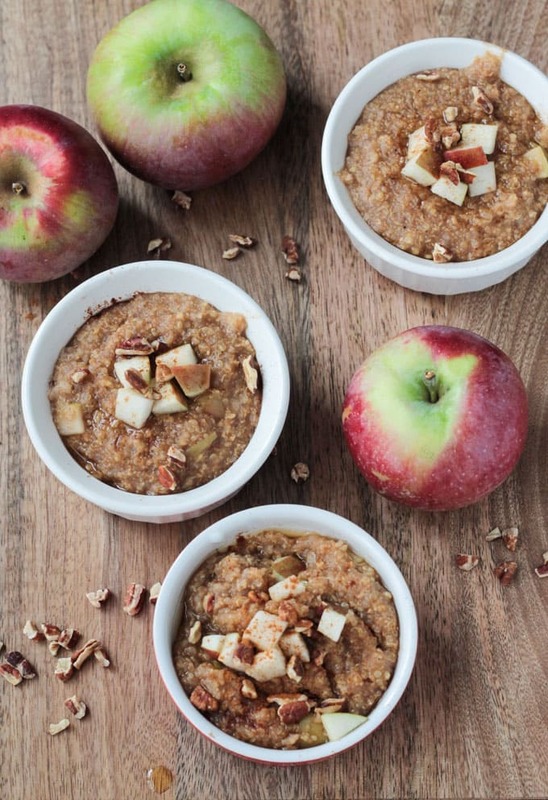 I hope you love this Hot Breakfast Cereal as much as we do. If you try it, please come back and leave me a comment below with your feedback. You can also find me on social media. Be sure to tag @veggie_inspired and #veggieinspired so I’m sure to see it. Enjoy! A heart healthy, protein and fiber packed hot breakfast bowl. Add quinoa, millet, amaranth and water to a pot and bring to a boil. Turn down heat to med-low, add the remaining ingredients and simmer for about 20 minutes or until grains have softened, stirring frequently to prevent sticking. If mixture is too liquidy, simmer for a few more minutes until desired consistency is reached. If the mixture seems too thick, take off heat and stir in a little more water or non dairy milk. 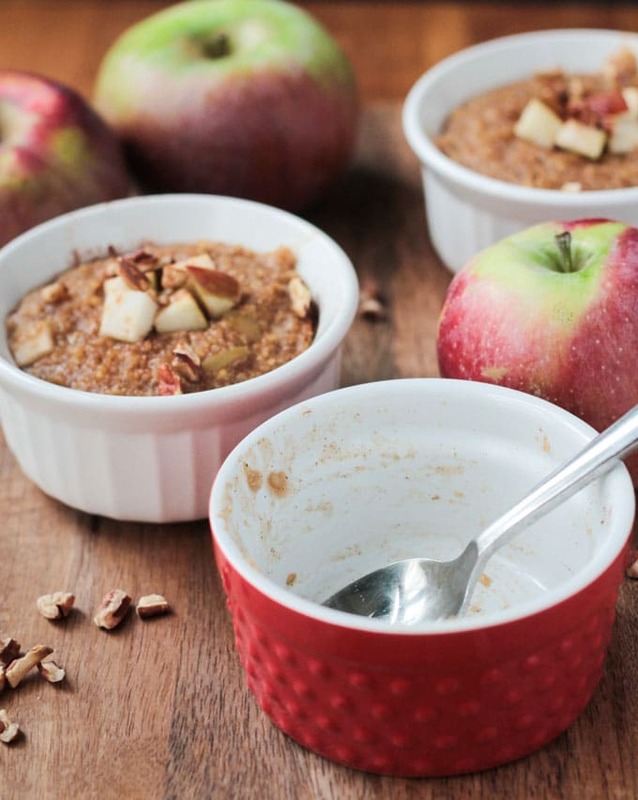 Serve warm topped with a splash of non dairy milk, more chopped apple pieces, and/or chopped nuts. ~Nutrition facts calculated without toppings. This looks so warming and satisfying! It is definitely a comforting dish! And very filling! Thanks, Becky! Hi! 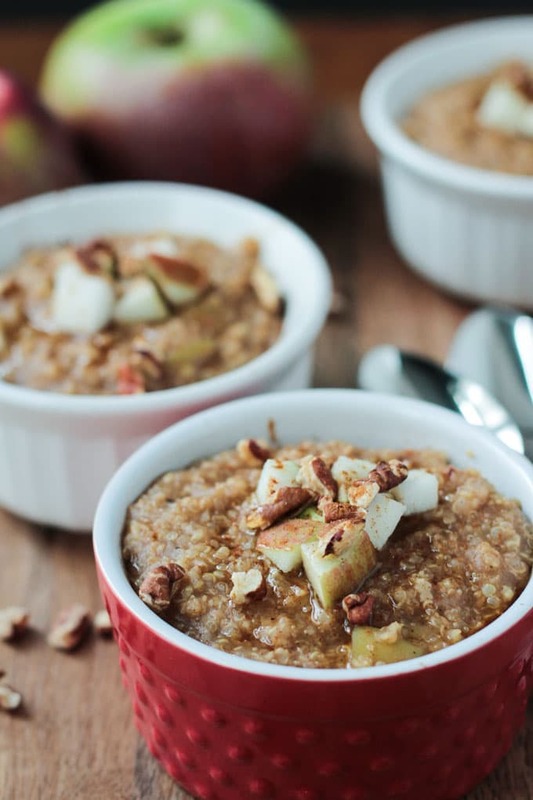 I was looking at your “Apple Pie Spiced Mixed Grain Hot Breakfast Cereal”—looks healthy and delish! Any idea of the calories, or Weight Watchers info? Then, you talked about how much your family loves oatmeal. I love it, too. For years I have eaten (not the instant), but the quick oats, with lots of milk and cinnamon/Splenda on top. Now, I want to give up any sweetener, and the milk. I tried just the quick oats and cinnamon last week—bleech. I’m guessing you use the steel cut oats, which I’ve bought, but never cooked. Then, what? I’m probably asking you what seems like a super easy “recipe” –one you don’t even think of as needing a recipe. However, if your daughter will eat it morning, noon and night, then, I’d really like to know what you do. Thank you!!!! Hi, Teresa! Thanks for stopping by! I don’t have the nutritional info, but you can plug it in to my fitness pal or nutritiondata.com and it should give you a rough idea. As for making yummy oatmeal without sugar, I do have a secret! Smashed ripe bananas!! Mix the smashed banana into the cold water before adding the oats and whisk it around until it’s mostly incorporated. Then add your oats and stir. Then turn on the heat and cook, stirring frequently, until desired consistency. You can then flavor with anything else you want: fresh fruit, dried fruit, peanut butter, cinnamon, nuts/seeds, etc. the banana gives a lot of sweetness!! I have never given my kids the packaged instant oatmeal or homemade oatmeal with sugar, so they are used to it that way. If you are used to it being much sweeter, try adding a tbsp or two of pure maple syrup (not the pancake topping stuff) and then reduce that amount little by little until you don’t need it at all! By the way, I generally use old fashioned rolled oats. They cook quicker than steel cut and get much creamier which is how my kids like it best. Let me know if you try it!! Forgot to mention also that adding everything to cold water and then hearing…as opposed to gearing the water and then adding everything in…makes it much creamier so you probably won’t need a lot if added milk, if any. Not sure why this works, but it does!